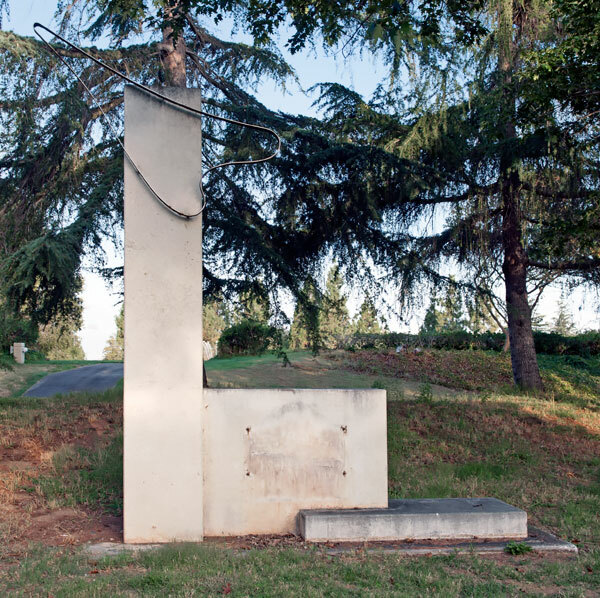 The plaque used to be located on Yerba Buena Road at the entrance to Evergreen College. When we photographed this location on 2 October 2011, the plaque was missing. This unattributed photograph was taken in the 1980s. Three-quarters of a mile northeast is Montgomery Hill, site of the 55 successful flights of the 'aeroplane' of John Joseph Montgomery which demonstrated aerodynamic developments still indispensable to modern aircraft. Here the basic principles of aerodynamics discovered by Montgomery were combined by his engineering skill and technology to produce a heavier-than-air flying machine which had complete control: the cambered wing, rear stabilizer, flexible wingtips, and wing-warping aileron. Plaque placed by the State Department of Parks and Recreation in cooperation with the County of Santa Clara and the University of Santa Clara, October 31, 1967. 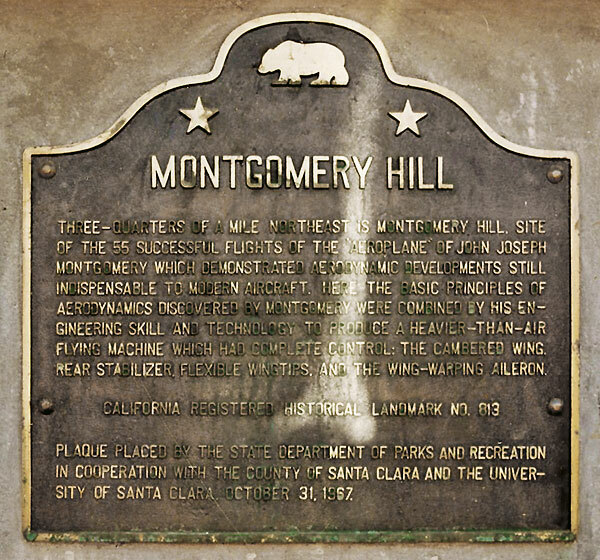 The old Montgomery Hill commemorative plaque on Yerba Buena Road went missing. A viewer of this web page sent us a photograph taken in the 1980s. A new plaque has been installed at the intersection of San Felipe Road and Yerba Buena Road. We have not yet photographed the new plaque.